2x2 economy LED flat panel light fixture is an office light shape you may be familiar with but more energy efficient than ever. This is a specially priced import with a 5-year warranty. It's LED array will provide long life and general lighting for many years to come without replacing bulbs. Designed for installation in conventional suspended ceilings for new construction or retrofit projects. Featuring superior, evenly dispersed lighting that sets the standard in performance for solid state ceiling luminaires. Designed for installation in conventional suspended ceilings for new construction or retrofit projects. Featuring superior, evenly dispersed lighting that sets the standard in performance for solid state ceiling luminaires. It even has a 0-10 volt dimming onboard standard for many types of electronic dimmers and lighting systems. It also has the highest color rendering index (CRI) of any LED light fixture at 90. This is probably one of the lowest cost LED light panels that we have for drop ceiling grids, but that doesn't mean it's cheaply made. It has basically all the benefits that you've seen in other light fixtures with 50,000 hour rated life, dimming capability and an integrated driver. It's perfect for any energy-saving project you may have coming up where you want to cut cost but still get maximum performance. The 5000K light color is also beneficial for people who want to have a pure white light for an office. This will help people see better, it works better with contrast and color making it a good light for productivity. You're going to get a fast payback on these as well just from energy savings and the fact that you don't have to ever replace a light bulb with these again. There are no light bulbs to replace, so all you have to do is enjoy the benefits of fewer energy consumed and fewer maintenance problems and expense. 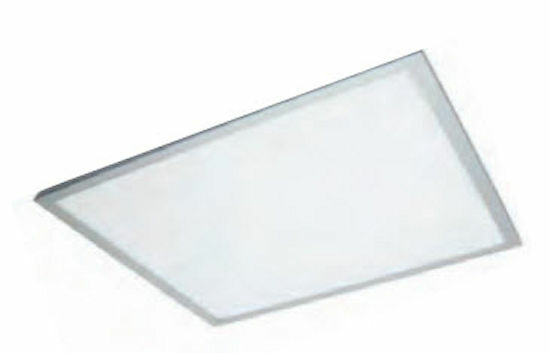 These are often used in conjunction with 2x4 LED flat panel light fixtures which we also have. The five-year warranty will protect you from any early failure, but you should get many years of reliable service and light output from this wonderful light at such a low cost. - Choice of 4000K or 5000K light color.